The budgie can be friends with many other types of birds. 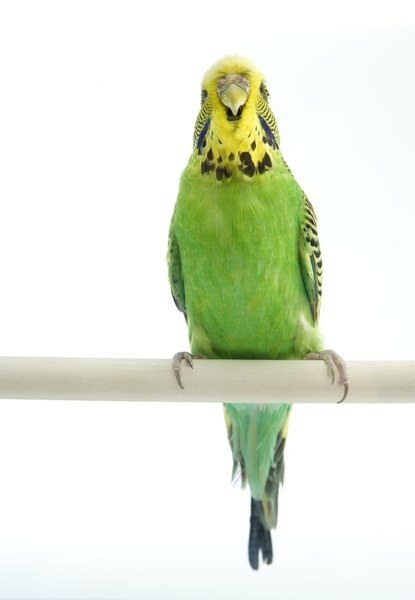 Flocks of budgies and cockatiels live together in the wild, so it makes sense that they may be able to share a cage in your home. Some pairs of cockatiels and budgies can live together peaceably, but there is always some risk that one of the birds could get hurt. Just like you and me, every bird has his own personality. Some birds get along so well that it's hard to imagine one without the other, while others seem to hate each other at first sight. With cockatiels and budgies, the similarities in personality seem to outweigh the differences most of the time, and the two can become fast friends. the cockatiel is often the easygoing one of the duo, while the budgie takes the leadership role. This doesn't always hold true. When a cockatiel and a budgie both have dominant personalities or don't have a tolerance for other birds in their territories, they may not ever get along well enough to share a cage. First impressions matter, even for cockatiels and budgies. The right introduction can set the tone for the entire relationship. Putting one in the other's cage without any introduction could be setting them both up for problems. The cage's resident may view the other bird as an intruder in his territory instead of as a potential friend. Introduce them in neutral territory, outside their cages. Give them plenty of time to get to know each other; repeat the experience several times before placing them in a cage together. Observe them closely for several weeks to make sure they are truly getting along well. Cockatiels and budgies have different nutritional needs and eat different mixes of food. Cockatiels require a diet higher in fat, which is harmful to budgies. Even if diet was the same, some birds who get along well normally won't share food. This doesn't have to be a barrier to sharing a cage, but it may mean that you need to either feed them outside the cage, away from each other, or feed each one at a different time, or place their food dishes at separate ends of the cage. During breeding season, even the mildest-mannered cockatiels and budgies can suddenly become territorial and intolerant of any other birds. This is usually more of a problem in a large aviary with a number of cockatiels and budgies in the same enclosure, but it can be a problem in a cage with two birds, especially if one of the females starts acting broody. Either the cockatiel or the budgie can become aggressive. If this happens, separate the pair until they both begin behaving normally again. Put two best friends together in a small space for too long and it's inevitable they'll end up fighting. The same happens with cockatiels and budgies are forced to share a tiny cage. They need a place with enough space that they can get away from each other for a while. At a bare minimum, a cage for these two birds should be at least 24 inches wide, 24 inches deep and 30 inches high. That said, it's best to provide the largest cage possible to give your birds plenty of room to play, stretch their wings and explore. Cockatiels are much larger than budgies; they can do some serious damage in a fight. The larger bird can kill the smaller one in a serious fight. It's not uncommon for the smaller budgie to pester and harass a mellow cockatiel so much that the cockatiel stops eating. A budgie can also do some damage of his own by pecking at the larger bird's feet or eyes. Careful observation is necessary to avoid problems if you decide it is worth the risk to house them together. Some bird keepers advise against ever keeping the two together.